Fixing is not a new word in the world of sports. Accepting huge amounts of money, expensive accessories, and gifts from match fixers (bookies) to perform poorly which leads to their team’s defeat is regarded as fixing in Sports. Commitment towards nation, towards people who believe them to be their super heroes, who believe that these sportsmen will make them proud by winning, that belief that commitment that feeling disappears, nullifies because of fixing. What makes life even more beautiful, exciting is its unpredictability. We never know what’s in stake for us the next moment. Fixing in sports takes away that excitement. Fixing in sports is like fooling people. Cheating millions of people just for money is a no good thing. But why do they do that, why the money, the wealth becomes more than respect towards nation, love they get from the people. Well there are some reasons. We are living in the 21st century where money and only money is most important. Desire to be rich is not wrong but taking shortcuts to achieve what u want, to fulfill your desires is certainly wrong. People who fall prey to match fixing are basically the one who want to be rich overnight. Values morals doesn’t matter, the only things that they think about is being rich and hence involve in match fixing. Cricket being an obsession in our country is certainly the most talked about sport. 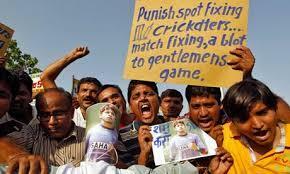 Over the past decade, Indian cricket has been rocked by scandals related to match fixing. What is significant here is that most of the cricket match-fixing scandals that have occurred in the last decade have had to do with the Indian subcontinent. In the year 2000, the whole nation was startled to hear the names of well known cricketers like Salim Malik, Mohammad Azharuddin, Ajay Jadeja and Manoj Prabhakar’s involvement in match fixing. While Ajay Jadeja faced a ban from cricket for five years, Manoj Prabhakar was disqualified from holding any post in the BCCI (Board of Control for Cricket in India), and Azharuddin, Malik were awarded life time banishment from cricket. It’s not only our cricketers but also crickets from countries like Pakistan, South Africa, and Sri Lanka, Australia have been involved in fixing scandals. 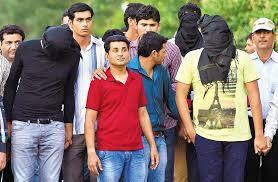 Latest fixing scandal is IPL. With several players already being punished, we can expect many more shocks. 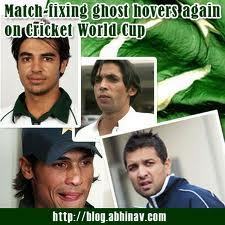 So there is a need to curb, stop this match fixing, and make the sport pure in all aspects. The era when we had Sachin, Ganguly, Dravid, Laxman was the golden era for Indian cricket. There is no dearth of talent in our country, but sportsmen need to get inspired from our cricketing greats, follow their values, and learn from them. Self realization is important. Young cricketers need to realize the importance of commitment towards the people who believe them and the nation. They must understand the fact that money is not everything. Respect is what matters.”Let your conscience be your guide”. Betting in our country is Illegal. But in the UK, where sport betting is regulated and a thriving industry, there are rare instances of player involvement in match fixing or even scandals of this nature. To tackle the problem, experts have suggested that legalization and regulation of gambling is probably the best solution. Banning is not going to help, as it will only motivate the industry to operate underground, as is the case with India, where the illegal gambling industry is worth almost 2,000 crore rupees. However, the public should demand solutions to match fixing. Law makers of our country are very keen to bring out new a law which strictly punishes the people who indulge in match fixing. As viewers all we can do is hope.